Box 752, Charleston, W. Va. The Negroes of this nation are standing squarely behind you in the prosecution of this war and are ready to make any sacrifice necessary to bring success, but we feel keenly the "stain" upon democracy at home when men and even women are lynched by mobs. I am sure you feel outraged when you read of the lawlessness of mobs in certain sections of our country, I am therefore asking that you make mention of this evil in your address of July 4th. 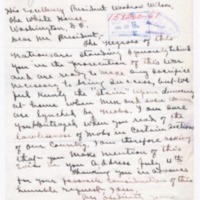 Sanders, William W., “William W. Sanders to Wilson,” 1918 July 2, TI001039, Race and Segregation Collection, Woodrow Wilson Presidential Library & Museum, Staunton, Virginia.